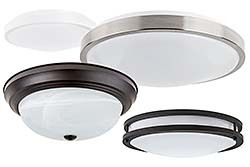 The dimmable LED flush-mount fixtures last up to 30,000 hours on average. The fixtures feature high lumen output, low energy consumption and maintenance-free characteristics. The uniform, diffused output creates a clean glow in natural or warm white. The fixtures are compatible with standard high-voltage dimmers.